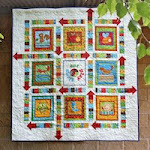 Thank you for your interest in my daisy chain quilt tutorial. The tutorial has moved and is available in its entirety at this link. Best wishes, Bloom. It's a beautiful quilt and one I would like to try. Thanks for putting the time and effort into the tutorial. 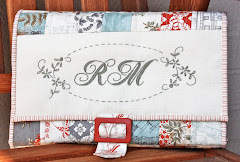 I love this quilt Ros. Both the design and fabric choices are delightful. I am making a variation using half square triangles, and in similar fabrics for my nieces 18th. It's a style of fabric I have never used, so thanks for the inspiration! 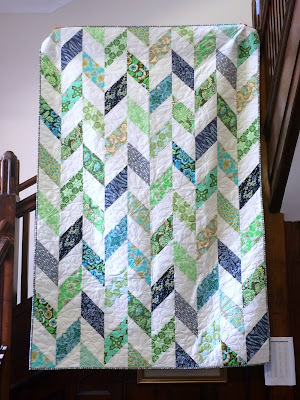 Wow your quilt is gorgeous - your tutorial looks great - one of these days I am going to have to try my hand at quilting, but for now I will just admire yours. Thanks for a great tutorial. I'm in the process of making it and I'm surprised how fast and easy it comes together. Thanks for the tutorial. It's great not to have to sew 1/2 square triangles to make this pretty quilt. This is very pretty! I must find the time to make it. Thanks for the idea. Thank you for posting this tutorial! I am hoping to use this tutorial to make a twin sized quilt for my son. About how much printed fabric did you use to make the quilt top? Are there any tricks to sewing the blocks together to form your columns? Also, how do you deal with the bias edges and keeping everything straight? Thank you for posting this! It's just what I've been looking for for a fabric bundle I've saved! I appreciate you sharing this!!! Have a great day! Is there a way to make the blocks bigger? Like if I doubled the size of my strips would that double the blocks? 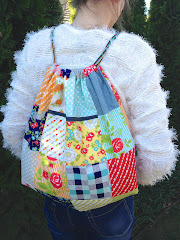 Love this tutorial and not having to make half square triangles. Thanks for the great pattern. One question: when trimming the top and bottom for finishing, do you leave an extra 1/4" for the binding seam allowance?